Have you ever started collecting something and didn't realize it until they were scattered about both at work and home? I noticed recently I started finding/collecting collage boards. This one is posted on my wall in my office. There are so many pictures you can no longer see the design. Yet, it doesn't matter, the people who are displayed matter. Friends and family adorn my wall. This Thanksgiving I will be grateful for more collages, like the one pictured below, to display more pictures of family and friends. Collages are similar to life, we began our lives with a blank slate and it's up to us to adorn ourselves with colorful pictures. Placing them strategically throughout all phases of our lives. What pictures would you place? What phase of your life are you in? The collector? The blank slate needing a re-birthing? The over whelmed one with too many pictures? No matter what phase your in, reflect, re-evaluate and restart! There's always a new collage around the corner. 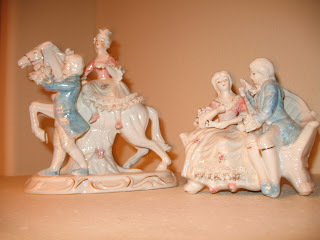 I found these figurines several months apart at two different yard sales. They reminded me of my Grandmothers house back in Phoenix when I was a little girl. 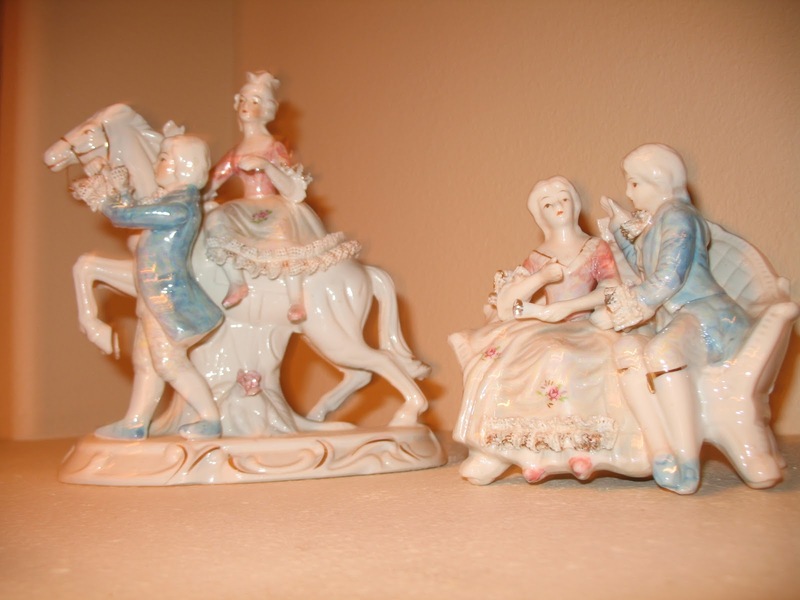 Grandma's living room was decorated with similar figurines and pictures. My mother would tell me stories of how Grandma cleaned "rich" peoples houses and occasionally when they redecorated they'd allow her to take some items home. Every summer without fail I would run into the living room to see Grandma's newest items. I could always tell them a part ,the items never seemed to match the rest of the house. The living room adorned ceramic tiles,thick carpets and colorful walls painted in rich bold colors of her Mexican heritage. The Pink Girl & Blue Boy figurine sat on the only t.v. in the house next to the rabbit eared antenna. Grandmothers "novela" was always on. I seem to only remember a handsome, tearful man sitting along side a hospital bed next to a gorgeous girl with long beautiful hair wearing fresh makeup. For years I thought all woman looked that good in the hospital. Warm serapes adorned couches while a Virgin De Guadalupe statue stood in the corner protecting us from evil and temptation. Needless to say Grandma's eye for detail & decorating seemed to make it all work. She made it her own with style, humbled grace and richness of family. I often wondered if my love for yard sales stems from my summer trips to Grandma's house. Weekly I am amazed what people practically give awhile. It's as if I carry the tradition of acquiring nice stuff from rich peoples houses. Is that deep or what? I am my grandmothers keeper. 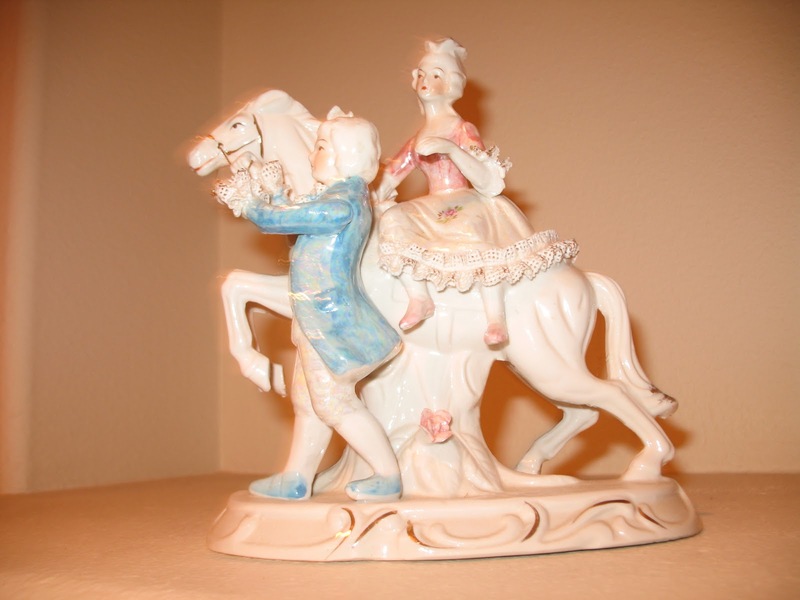 The keeper of wonderful memories of the Blue Boy & Pink Girl figurines with their gracefulness and elegance. In this age of technology, I am hoping to enrich my children with some traditions. With the Holidays coming up maybe I can create some new traditions while maintaining old ones that adorn my past. What family traditions are you needing to honor? Needing to start? I have always said , it's best to honor where you came from, know where you are now and where you want to go. It's the same for traditions- like the Spanish rolling of the "r"....Rachel's "R'S .. remember, rejoice, reclaim and redo. We need to always strive to be better than the last generation. The Holidays are drawing near . This little Holiday dress was up for sale @ last weeks yard sale adventure- It was only $1.00 - It's a size 4T. Something came over me while reminiscing of my daughter Julia(11) as toddler . I stood there longing for the days I could dress her up like a little doll. At times, I wish I could still influence her dressing attire. Well, I am sure she could say the same about me when I sport an outfit she deems unmotherly. I remember there was a time we could share the same shoes, now my size 4 can't compete to her 8 1/2. I don't know anyone who wears a size 4T. I guess I wanted to play dress up again . A feeling I'll never out grow. I have a mannequin in my living room , I dress up in clothes I can no longer squeeze into. As a matter of fact some outfits I could never wear . Yet,my mannequin , named Becca ,looks awesome in anything! Most people hide the "too small clothes" in their closets, I display them in hopes it inspires me to lose weight. It doesn't. I must remind myself to stay in the moment and remember to capture Julia , here and now . Before you know it ,there will be prom dresses, graduation gowns , wedding dresses , power suits, then hopefully maternity clothes. For now this little Holiday dress hangs on a hook in my living room. It will be part of my Holiday decorations. I can no longer dress up Julia yet I can decorate the house and still dress Becca........all is good in the fashion world of little dresses. 21 Drops. Aromatherapy like you've never known it. I met Coach Jimmy @ the Fedor Training event. When I couldn't figure out how to use Tito's camera, Coach Jimmy and I exchanged business cards and he later sent me photos he took! When I set my intention for something I'd like to "see" at an upcoming yard sale, It's my intention, my desire for a materialistic item at a cheaper rate. I find more often than not, there are things " I am led too." For instance, when exercising isn't in my vocabulary let alone a goal or mindset,it's as if the yard sales Gods come calling. They come a knocking with a visual aide in form of a yard sale item. I found for $3.00….Is this telling me something or what! Signs play out in all aspects of my life. You know when we "keep" hearing someone's name "popping" up. It's as if they are "calling" us for a certain reason. The food cravings we desire can be a sign our bodies "missing" certain nutrients therefore a "sign" to eat a particular ingredient. When your Husband purchases a thigh master for your Birthday, that may be a sign he very well may be a "future" ex husband someday. Well,5.5 years to be exact. When your daughter at the age of 3 wants red streaks in her hair and loves the color black, it may be a sign she's been here before. Signs are everywhere, look around today -what signs are you missing?